In the early 1970s, owners James & Lauris Rose began their orchid careers in the commercial realm, both working for Santa Barbara Orchid Estate. They met and married, eventually purchasing their own nursery across the street from Orchid Estate in 1987. The inventory at Cal-Orchid is very diverse and reflects the interests of not only the current marketplace, but also many trips made to foreign locales. James has long been known to have a sharp eye for the unusual. They are located on the Pacific Coast in Santa Barbara, two short blocks from the beach. They maintain 25,000 square feet of intermediate temperature controlled greenhouse as well as an additional 25,000 square feet of saran-covered shade area. They offer plants for everything from coastal Southern California gardens, greenhouses to windowsills. Located on five acres of beautiful coastal Santa Barbara, the Orchid Estate is just 500 feet from the Pacific Ocean. Santa Barbara Orchid Estate was founded by Robert J. Chrisman, a legendary orchid grower. The estate was managed by Paul Gripp in 1957, and later, in 1967, he purchased it. Paul Gripp retired in 1986, and currently, his two children, Parry and Alice are the owners. The Orchid Estate is one of the world's foremost collectors and propagators of orchid species and hybrids, specializing in outdoor temperature tolerant varieties. 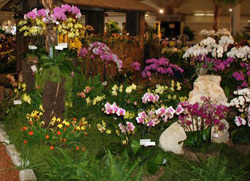 Gallup & Stribling has been a premier supplier of orchids throughout the world for more than 50 years. Founded by Aleck Stribling as Aleck’s Orchids in 1947, the business became a partnership when Emmet Gallup joined in 1954. It expanded into its present corporate form in 1959. Gallup & Stribling's home farm occupies 48 acres along the central California coast just south of Santa Barbara, one of the largest in the country. With more than 1.5 million square feet of greenhouse space, it is a state-of-the-art breeding, growing and distribution facility. Owner Jim Burkey began working with orchids in the late 60s and early 70s with Paul Gripp at the Santa Barbara Orchid Estate. In 1979, he launched his own operation, Orchids Royale, with his wife Noelle on a former avocado ranch. Orchids Royale grows mostly cymbidiums, but also paphiopedilums, miltonias and odontoglossums. They maintain 70,000 square feet of temperature-controlled greenhouses. Founded in 1978 as Westerlay Roses, Westerlay Orchids is a family-owned and operated commercial grower of orchids. The company was started by Joe Overgaag following his emigration from the Netherlands to Carpinteria, and later he earned the distinction of being among the first in the nation to widely apply hydroponic growing technology to flowers. In 2003, Westerlay leveraged its superior greenhouse technology and the area’s climate to enter the strongly growing potted orchid market. Westerlay Orchids currently grows approximately 600,000 Phalaenopsis and cymbidium orchids annually and continues to evolve. Westerlay Orchids sells to wholesalers, supermarkets and home improvement chains in California and adjacent states. Zuma Canyon Orchids was founded in 1971 by Dr. James McPherson and Amado & Maria Vazquez. Dr. McPherson's love of plants and his association with the Vasquez family, who were at the time growing for the Arthur Freed Orchid Co. down the street, grew into a lifelong friendship that eventually turned into Zuma Canyon Orchids. After 20 years or so of association, Doctor McPherson passed away, and Jean McPherson, his wife, continued as a partner of Zuma Canyon Orchids. When Jean retired Zuma Canyon Orchids fell under the umbrella of the Vazquez family. George Vazquez, owner, has been growing orchids for about 30 years, is an accredited orchid society judge, and served in various positions on many committees for 17 years at the American Orchid Society. They specialize in high-quality phalaenopsis and dendrobium, hand-grown in their Malibu greenhouses.